Chervil scientifically known as Anthriscus cerefolium sometimes called French Parsley, Sweet Cicely, cicily, garden chervil, gourmet’s parsley, Rich Man’s Parsley, Beaked Parsley and Salad Chervil is a delicate annual herb related to parsley. It belongs to the botanical family Apiacea, and it is native to Europe. Chervil comes from the carrot family along with dill, parsley, and fennel. 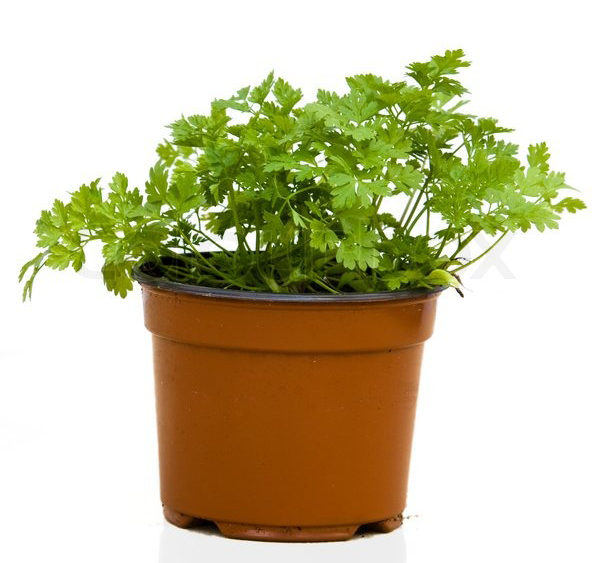 It looks extremely alike to parsley, except the leaves are smaller, lacier, and paler in color. Chervil also shares one of the same aromatic compounds as tarragon, which gives it a very delicate anise aroma and flavor. It is commonly used to season mild-flavored dishes and is a component of the French herb mixture fines herbes. It looks like a slightly paler, more delicate, and more finely shaped flat-leaf parsley, but with frillier, thinner looking leaves. Sometimes bunches of chervil will have leaves that are quite tightly closed, almost flower-like. 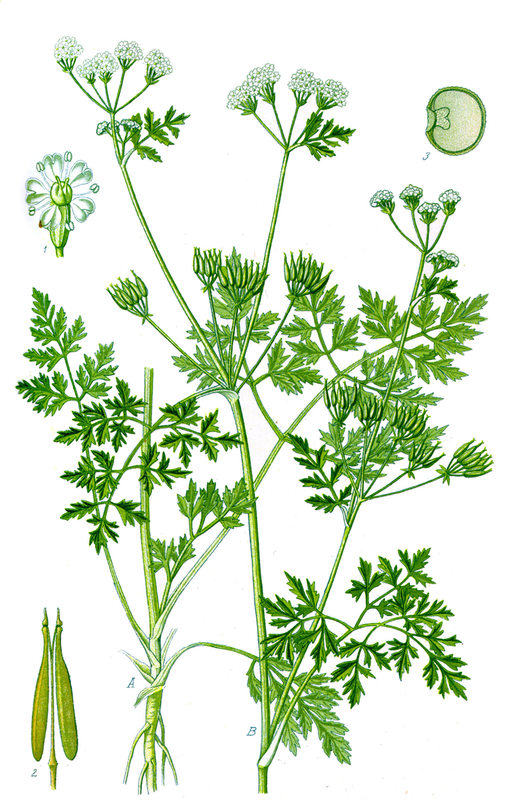 Avoid chervil with actual blossoms attached to it—that usually means the herb will have turned a bit bitter. 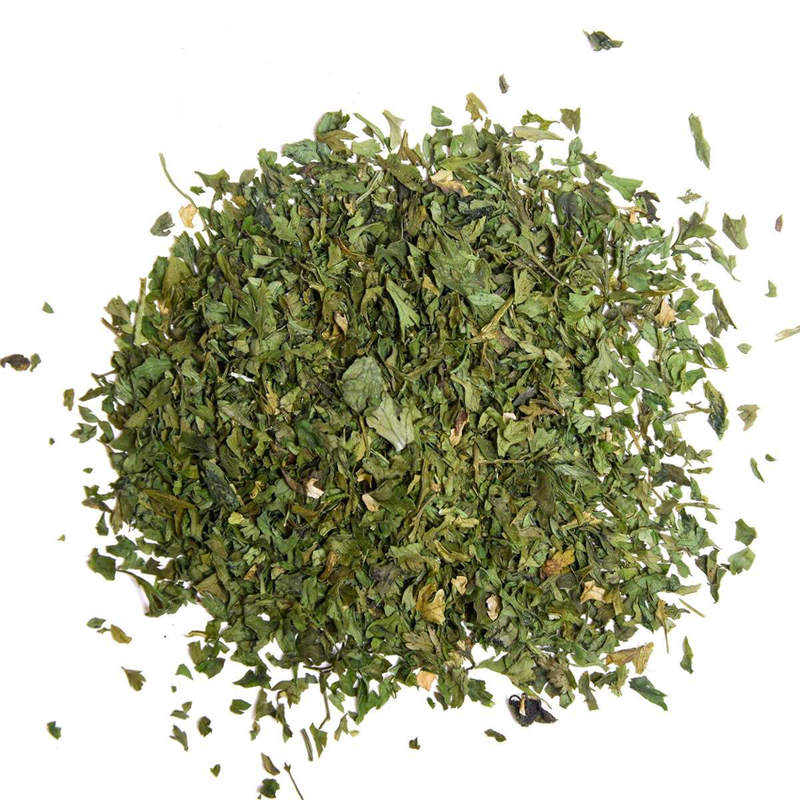 The herb is aromatic, with a pleasant sweet aroma, the smell ranging between parsley and anise. 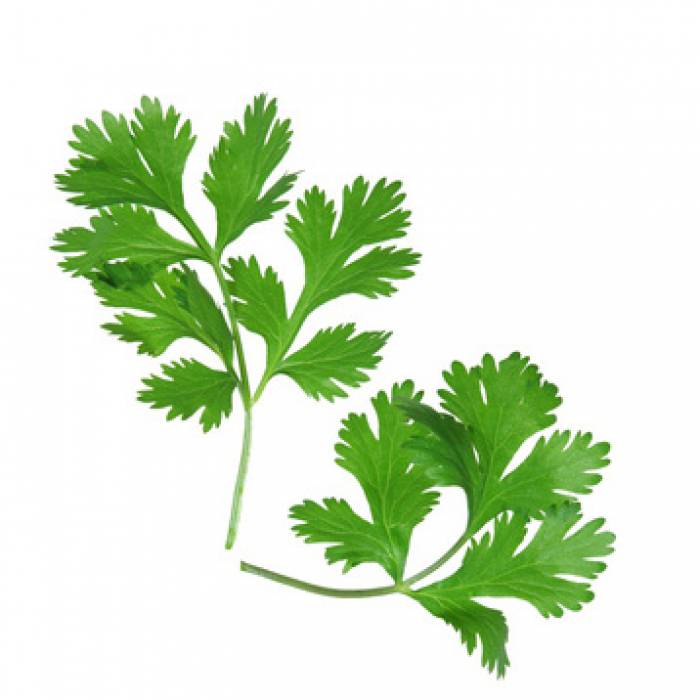 It is used as a flavoring agent and garnishing ingredient, just as coriander and parsley. It may also be used as dried herb, which is less aromatic, but a useful constituent of various herbal preparations. Chervil is a low growing small annual herb growing up to height of 12-24 inches (300-610 mm) (25-70 cm) and a width of 6-12 inches (150-300 mm), (30 cm), mainly 2 ft. The plant grows best in cooler temperatures, in shady spots and it likes lots of water. It prefers moist, humus-rich soils with good drainage. The plant has white, thin and single sturdy taproot with furry hollow, finely grooved, round, much branched, light green and hairy stem. Leaves are lacy, fern like, light green leaves are opposite, compound and bi pinnate; they are sub-divided again into opposite and deeply cut leaf lets. The lower leaves are pointed and the upper leaves are sessile with stem sheaths. White spots usually appear on the leaves as the plant ages. Flowers are white in color and are delicate, dainty, arranged in tiny umbels and grow into compound umbels. Flowering normally takes place from May to June. The Chervil plant produces 1 cm long, oblong-ovoid with a slender, segmented and beaked fruit which is initially green, but soon become shiny and brown-black as they mature. It has aromatic flavor and faint taste of liquorice or aniseed. 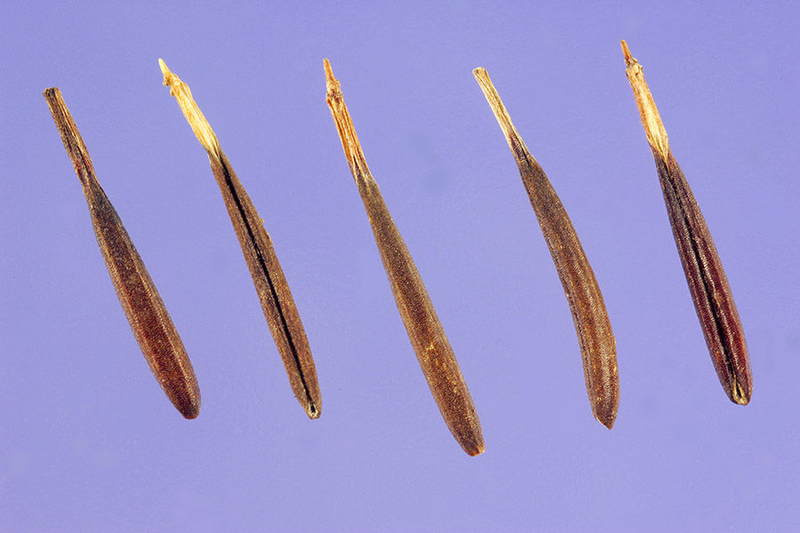 Seeds are long, pointed with a conspicuous furrow from end to end. Fruit normally matures between June to July. It has a rich flavor and adds taste to the food. Apart from a flavoring agent, this herb is used in a wide range of medicinal benefits for skin, hair and health. It may also be used as dried herb, which is less aromatic, but a useful constituent of various herbal preparations. Herbal infusion containing chervil can also act as an immune-building tonic. In order to make this tonic, add ½ teaspoon of chopped chervil, vervain, and red clover in a cup of boiling water. Allow it to steep for 5 to 10 minutes. The tonic thus prepared can be taken once in the morning and evening to ward off an illness. Large number of women has been noticed struggling with water retention problem. It happens due to malfunctioning of kidneys. Since chervil has diuretic properties, it helps in eliminating excess of fluids from the body. In case you are searching for an easy home remedy to relieve hiccups then chewing fresh leaves of chervil may cure hiccups. Traditionally, during the middle Ages, taking a teaspoon of chopped chervil was supposed to be effective in getting rid of hiccups. This can also be combated by consuming chervil leaves dipped in vinegar. Chervil is considered one of the strong expectorant that may help liquefy the trapped mucus and facilitate its expulsion from the respiratory tract. It is helpful in treating a productive or wet cough, as it eases chest congestion. Productive cough is commonly related with respiratory infections such as bronchitis may respond to the use of chervil. Research has discovered that consumption of chervil helps in improving the functioning of digestive organs and kidneys. It helps to make them strong, healthy and vitalized. Menstruation is a common phase through which every woman goes in her life. This problem brings so much discomfort in some women. These discomforts include abdominal pain, body cramps, mood swings, irritation etc. It is recommended to consume little amounts of chervil to get comfort during that time. Consumption of processed foods, artificial sweeteners, oily foods, sweet items, meat etc. does not add any nutrition to your diet. These types of food are responsible for major illnesses which most of us are facing today. One of the health problems caused by it is higher levels of bad cholesterol. Chervil is one of the best options to lower the high levels of cholesterol easily. So ensure that you consume this herb regularly to combat this illness. Chervil is a wonderful source of important minerals such as calcium, manganese, iron, zinc, magnesium, and potassium. Potassium helps to lower the blood pressure by neutralizing the negative effects of sodium in the body. It also helps the kidney in controlling the amount of bodily fluids, which is another factor that increases blood pressure. About 100 g of dried chervil offers a significant amount of dietary fiber (around 11.3 g), which assists in keeping the digestive system healthy. Sufficient fiber in the diet is vital to maintain normal bowel movement, in turn improving digestion. So, addition of chervil to everyday meals can surely contribute to enhance digestive function. Chervil is quite beneficial for proper functioning of the heart and hence prevents number of issues related to blood flow from happening. They prevent varicose veins, hemorrhages and other similar issues as well as cure low blood pressure. Eye is an important part of our body without which the entire world will appear dark to you. Now, this herb helps in improving your vision. Nowadays we people are too much inclined towards the screen of laptop, television and smart phone, which may create a negative outcome to your eye due to the rays produced from the screens. You have to consume this chervil herb in raw or in cooked form and get improved vision. So include it in your regular diet to get benefited. 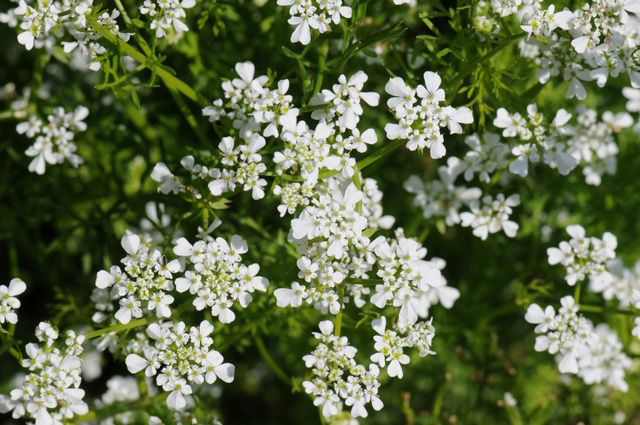 Chervil consists of antiseptic and disinfectant qualities which help to cleanse the skin thoroughly. If you have cuts, bruises, scrapes or wounds on your skin then apply this paste. This paste does not give you a burning sensation but is very mild on our skin. Thus it is quite beneficial for the skin. As mentioned before, Chervil consists of plenty of minerals and antioxidant like selenium, manganese, potassium and magnesium. These minerals along with antioxidants help to remove free radicals from your body and keep our body fit and healthy. Chervil paste is used to treat several serious disorders of skin like eczema. This paste helps you relive from dry, itchy and scaly skin naturally and quickly. You must have family members or friends with low blood count or low RBC count. Low RBC count is dangerous for the health. So it is important to have those foods that increased the production of blood in your body. Chervil herb is one among the natural ingredient that is helpful in production of blood. Regular use of Chervil paste is good for oily skin. It prevents acne and pimple breakouts. It gives you spot less skin every day. Pregnancy leads to development of stretch marks on your body. Since they look bad you have to constantly hide these marks. Frequent use of Chervil helps in lightening these abdominal marks naturally and easily. Hair fall is one of the major hair problems nowadays. People with all age groups are suffering from this problem. Applying chervil juice over the hair and its root will be wonderful for preventing hair fall. In case your skin gets burned with the harmful rays, apply the paste of chervil on the affected area to experience its soothing and healing touch. This paste helps in lightening the complexion of your skin naturally. Dark spots, wrinkles, uneven skin tone is also a major health problem nowadays. Even expensive cosmetics do not give favorable result. Paste of chervil herb along with 2-3 drops of lemon do a miracle for such problems. Mix them properly and apply over your face. Wait for 20 minutes and wash away. You will get beautiful and good textured skin. Since chervil possesses diuretic properties, consuming this herb regularly cleanses the kidneys and bladder by stimulating the production of urine. In this way, the bacteria and waste products in the excretory organs will be flushed out of the body. Its flavor and fragrance resemble the myrrh brought by the wise men to the baby Jesus. 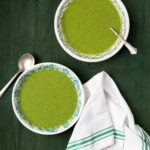 Because of this and because chervil symbolized new life, it is linked to the Easter celebration in parts of Europe where it is traditional to serve chervil soup on Holy Thursday. 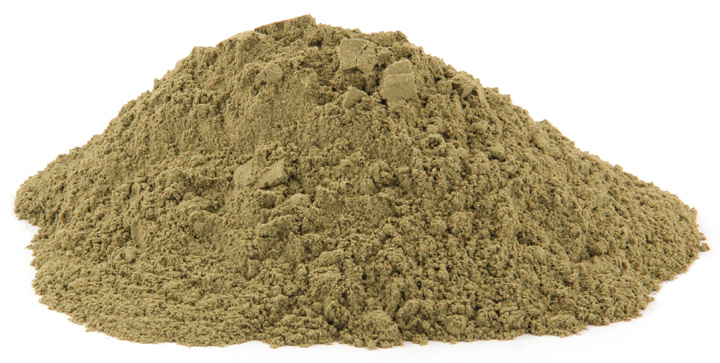 The warmth of this herb suggested medicinal uses to many of history’s herbalists. The first-century Roman scholar Pliny and the seventeenth-century herbalist Nicholas Culpeper believed that chervil, as Cuipeper put it, “does much please and warm old and cold stomach” During the Middle Ages, chervil was used for a variety of ailments. Eating a whole plant reportedly relieved hiccups, a practice still tried by some people today. Garden Chervil- plain or curly. Root chervil (Chaerophyllum bulbosum) – Cultivated for its tapering, parsnip-like root, which used as a vegetable. It was claimed to be useful as a digestive aid, for lowering high blood pressure, and, infused with vinegar, for curing hiccups. It is used as a ‘spring tonic’ for cleansing the liver and kidneys. It is a good cure for digestion and is said to be wonderful in treating poor memory and mental depression. Fresh plant, harvested just before flowering, is digestive, diuretic, expectorant, poultice and stimulant. Juice is used in the treatment of dropsy, arthritis and chronic skin ailments. 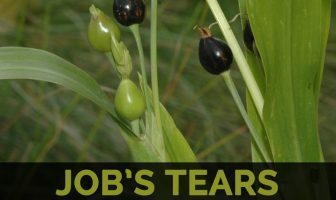 Bruised leaves are used as a poultice for slow-healing wounds. Warm poultice is applied to painful joints. An infusion of the fresh leaves is used as eyewash to treat sore or inflamed eyes. 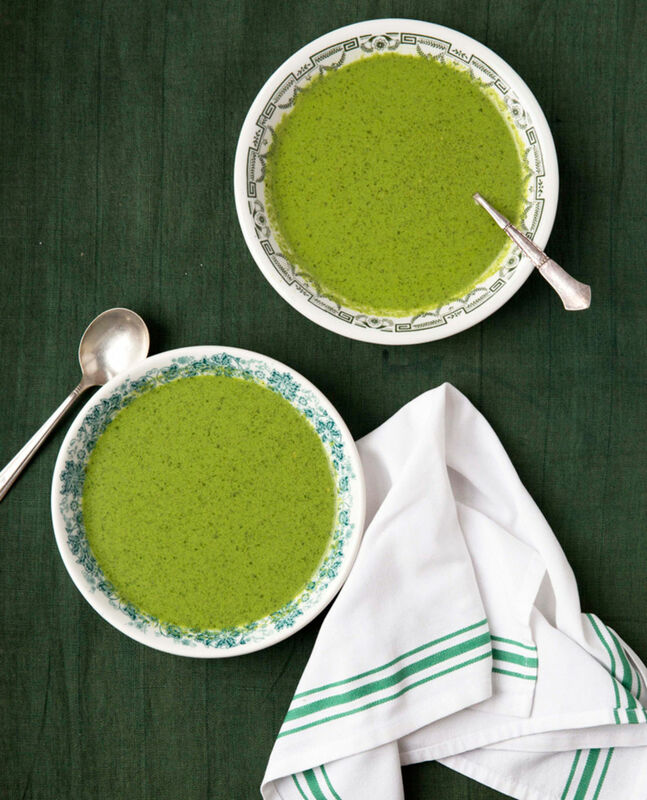 Eat some chervil to banish those irritating hiccups forever. Mild dose of Chervil every day can help lower high blood pressure. Chervil can improve your digestive and kidney health. 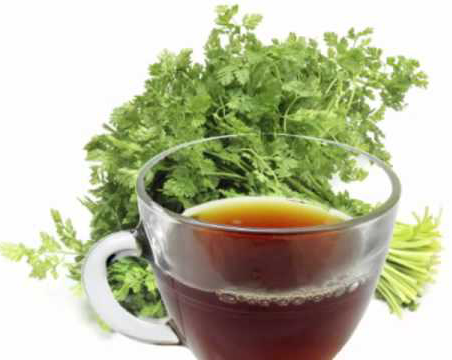 Chervil can eliminate excessive fluids from your body. It can help lighten stretch marks on your abdomen naturally. 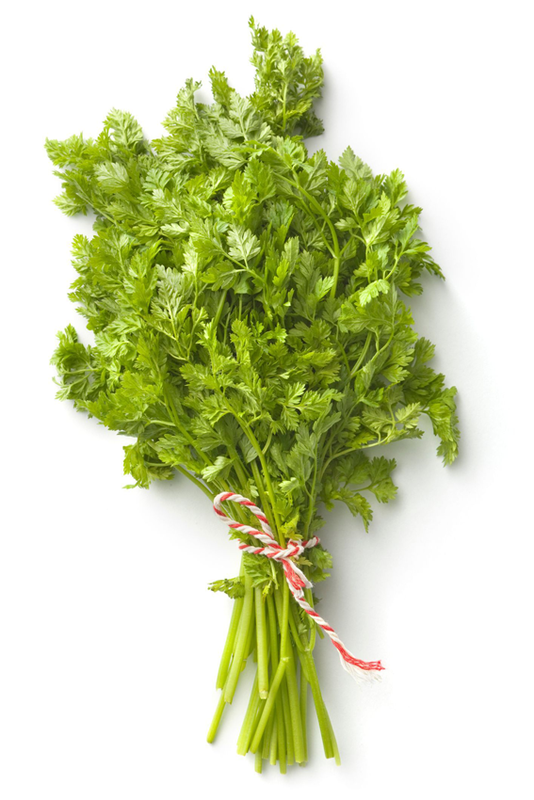 During the first trimester, chewing on chervil can reduce morning sickness. Apply chervil paste to lighten skin tones naturally. Apply some chervil paste on the affected parts of your body, it can provide relief from the symptoms of eczema. Use chervil paste to cleanse your pores and prevent pimple and acne breakouts. Chervil oil, when massaged into your hair, helps to strengthen hair follicles, thus preventing excessive hair loss. Oil help to improve texture and appearance of dull, dry hair. Chervil oil can protect hair from the harshness of weather. Chervil is a rich source of vitamin A, making it useful to enhance vision. 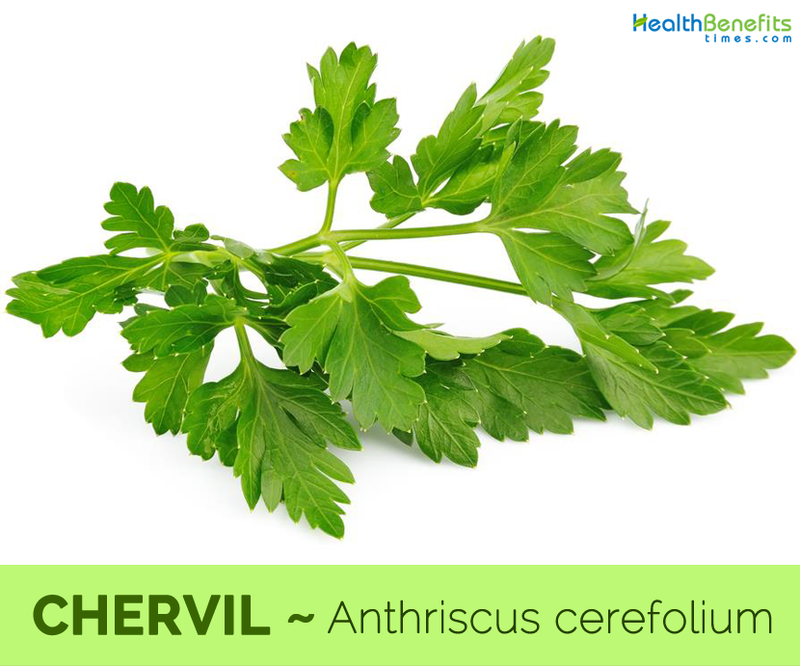 Chervil is known to help in the treatment of cystitis, kidney, and bladder stones. Chervil may be used to relieve the pain caused by insect bites. It is very effective against common cold and flu. It also prevents and cures mouth ulcers and gum diseases. Consuming chervil is an excellent way to increase your lagging vigor and reawaken low spirits. Chervil steeped in brandy was once used as a face splash in the evening to tone the skin. Juice of the stems and leaves has been rubbed on blemishes. Applying the tea as part of a face mask can reduce the appearance of wrinkles and improve the elasticity of the skin. Chervil is used, mainly in France, to season poultry, seafood, young spring vegetables, soups, and sauces. Fines herbs are added at the last minute, to salads, omelets, and soups. It is used raw in salads or used as a flavoring in cooked foods. Leaves are often used as a flavoring; they form the basis of the seasoning ‘fines herbes’ and are an essential ingredient of ‘bouquet garni. Flowers are used as a seasoning. Root is said to be edible. Chervil is a good addition to omelets. Chervil is commonly used in making a classical Béarnaise sauce. Add chopped chervil to your omelets or scrambled eggs. 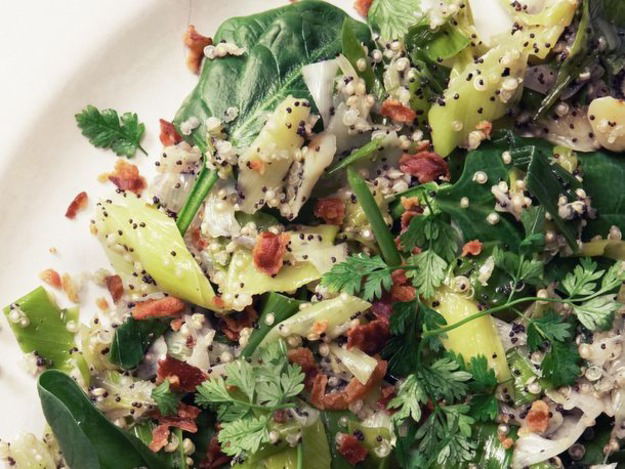 Sprinkle freshly chopped chervil over your salad. Add chervil as a garnish to soup. Add to a homemade potato salad. Add fresh leaves to white wine vinegar and use as a salad dressing. Crush leaves, mix with melted butter and pour over grilled fish or poultry. Add to cottage cheese to eat with a jacket potato. Mix with egg mayonnaise to eat in a sandwich. Add to any creamy soup. Use the leaves to stuff fish or chicken before cooking. The growing plant is said to repel slugs. 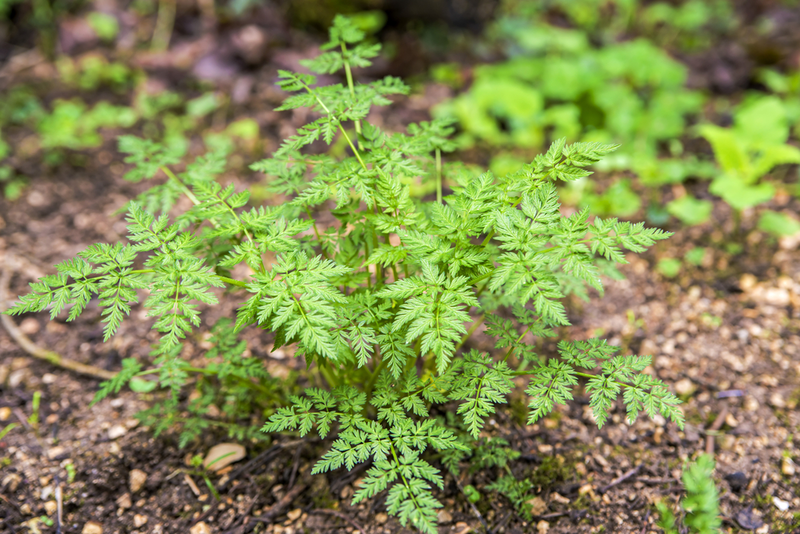 Laying cut leaves of chervil in your house is said to repel ants. Do not collect chervil from the wild as it features similar plant morphology to poison hemlock, or fool’s parsley and water dropwort. Chervil oil may cause dermatitis in some sensitive individuals. Fresh chervil can be available year around in the farmer markets. Dried leaves can easily be found in the spice section in packets, air-sealed bottles, etc. and sometimes as a “fines herbes” mixture. If you are growing them in your backyard, its leaves are ready for harvesting within about six to eight weeks after sowing the seeds. 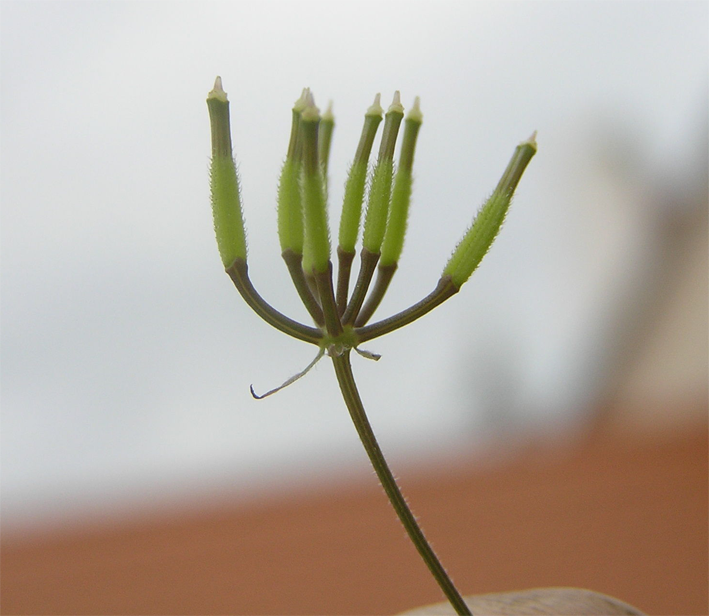 Gather its leaves before the plant begins showing flowers. In the farmer markets, buy fine, light-green, fresh leaves and firm stems. Avoid wilted, spots, sunken yellow leaves. Bring chervil stems and stock to a simmer in a 4-qt. saucepan over medium-high heat; simmer, covered, until stems are tender, 8–10 minutes. Strain stock, discarding stems; return to pan and keep warm. Purée chervil leaves, cream, parsley, yolks, salt, and pepper in a food processor until smooth; transfer to a bowl. Whisk 1 cup broth into yolk mixture, then slowly whisk into remaining broth until smooth. This dish is an excellent starter particularly for dinner parties if you want to impress. Strips of delicate sole and smoked salmon are stuffed with a lime filling, baked in the oven and served with a chervil and yogurt sauce. To make the fish stock, place the head of one cod or salmon together with the skin, bones and trimmings into a large saucepan. Cover the fish with water and bring to the boil. As the water starts to boil, remove any surface scum with a spoon and discard. Add 2 sliced onions, 2 chopped sticks of celery, 1 sliced carrot, 2 bay leaves and a squeeze of lemon juice. Cover the saucepan, reduce the heat and simmer for about 30 minutes. Once you have a flavorsome stock, strain the liquid through a sieve, allow to cool and refrigerate. Use within 2 days. Mix together the whole meal breadcrumbs, soft cheese, lime juice and lime rind in a small mixing bowl until a stuffing-like mixture has formed. Set aside. Place the sole fillets onto a clean surface and skin them by holding the tail end of the fillet with one hand, inserting a sharp knife at the same end and passing it down through the fillet between the flesh and the skin. The flesh should tear off in one piece. Cut the sole fillets in half lengthways. Place one slightly smaller strip of smoked salmon on top of each strip of sole. Divide the lime stuffing into 8 and carefully spread on top of the smoked salmon. Carefully roll the fish up into a coil-like formation making sure that the stuffing and salmon remain inside the sole. Place the rolls seam-side down into an ovenproof dish and pour in the fish stock. Remove the fish rolls from the oven and transfer to a warm serving dish. Cover and keep warm. Pour the cooking juices into a small saucepan. Add the natural yoghurt and the freshly chopped chervil and gently heat, stirring the ingredients together. Serve the fish rolls with the sauce and garnish with fresh chervil. Serve immediately. Plant Size Height of 12-24 inches (300-610 mm) (25-70 cm) and a width of 6-12 inches (150-300 mm), (30 cm), mainly 2 ft. Leaf The lacy, fern like, light green leaves are opposite, compound and bi pinnate; they are sub-divided again into opposite and deeply cut leaf lets. The lower leaves are pointed and the upper leaves are sessile with stem sheaths. White spots usually appear on the leaves as the plant ages. Fruit Color Initially green, but soon become shiny and brown-black. Chaerophyllum nemorosum Lag. ex DC. Calories 5 K cal. Calories from Fat 0.63 K cal.